Around mid July, when the monsoons are in full swing, the humidity climbs and Todd’s Backyard starts getting lush. 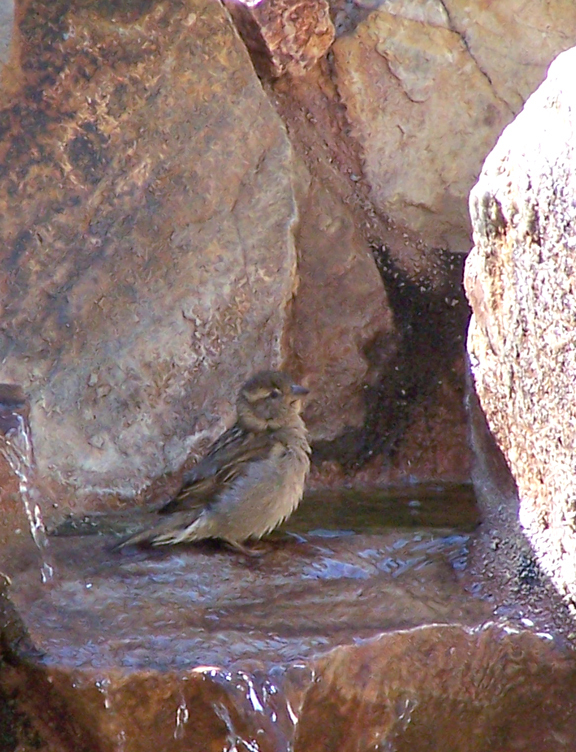 And, us lushes start getting a little lushier since the most entertaining activity (that doesn’t require a lot of sweat), is to sit on the porch with a cool drink and watch the desert wild’s. One of the main attractions this time of year, is a little oasis we like to call…the pond….because, for lack of better words, that’s what it is. 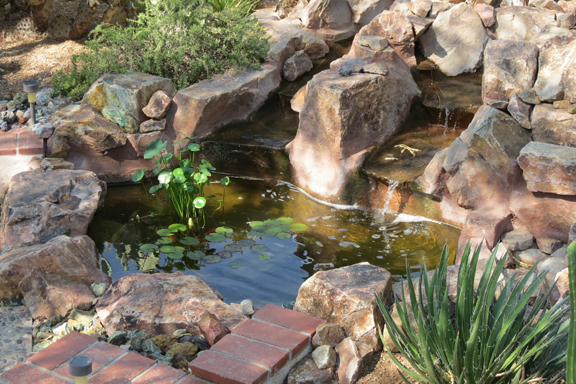 It started as just a ‘water feature’, but over the years, Todd has added some water plants, and then some fish, and Wa La!…. it’s a pond! It has become it’s own happy little ecosystem, and thriving under Todd’s TLC. Also a source for liquid refreshment for all kinds of critters! 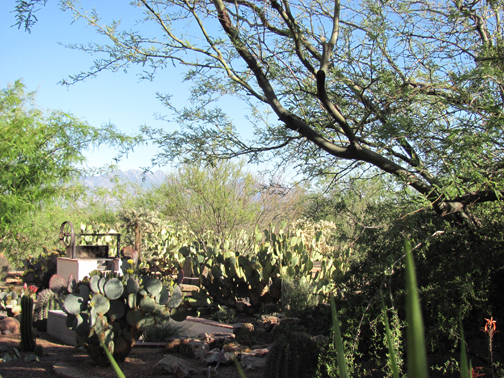 The rabbits, assorted squirrels and javelina frequent the pond to get a drink. We’ve even seen the bobcat quenching his thirst ! (Where’s the camera when you need it!) You might think the bobcat might try his hand at fishing, but either he doesn’t know that these strange bright orange fish are food, or he just hasn’t seen them. The fish are elusive! 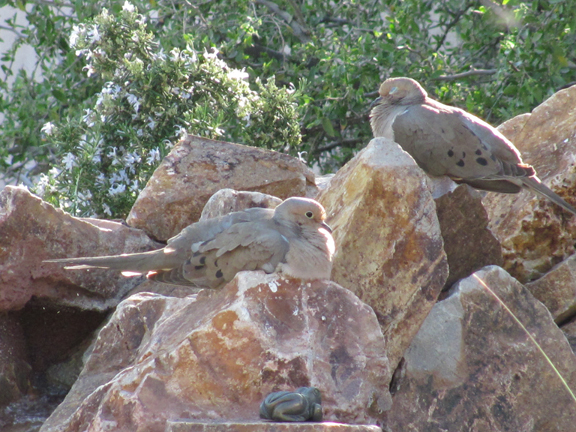 Anytime anything or anyone gets close, they dart under the rocks. So, unfortunately, we rarely get to enjoy watching them up close. 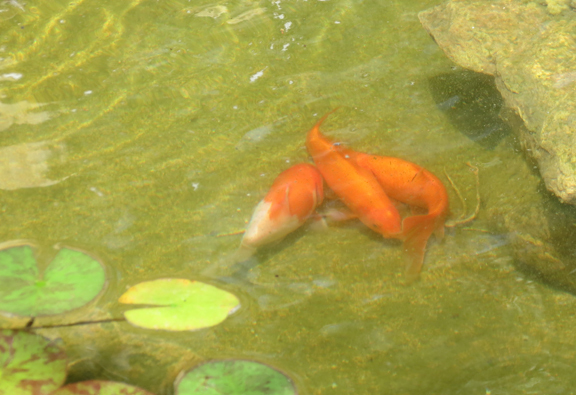 Yes, the pond adds a calming sense of peace and tranquility to Todd’s backyard…. Then, let the ruckus begin! 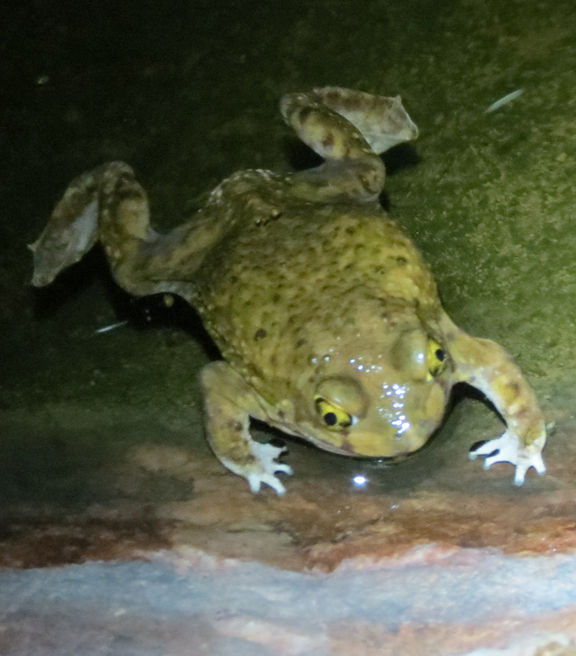 Happily frolicking and splashing around, two slimy frogs where having the time of their life! Both croaking at the top of their lungs, with a chorus of others that were hanging around in the bushes. I am not a frog fan! But the longer I watched, it was kind of fun seeing them have fun. Their little slimy bodies gracefully swimming and diving in the clear, flashlight-lit water. Now, if these were Colorado River Toads, I don’t think I would have been so entranced. 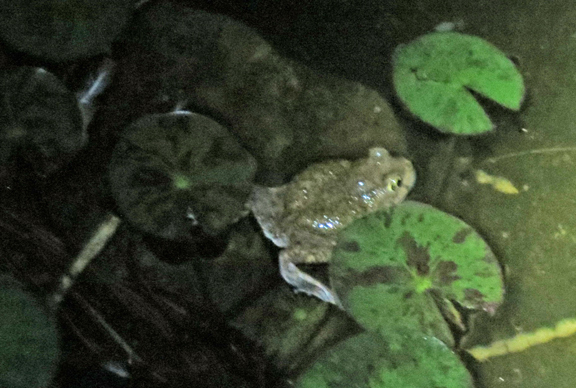 (I don’t believe these were river toads as they are much smaller, lighter green and have different eyes). The toad creatures are hideous! 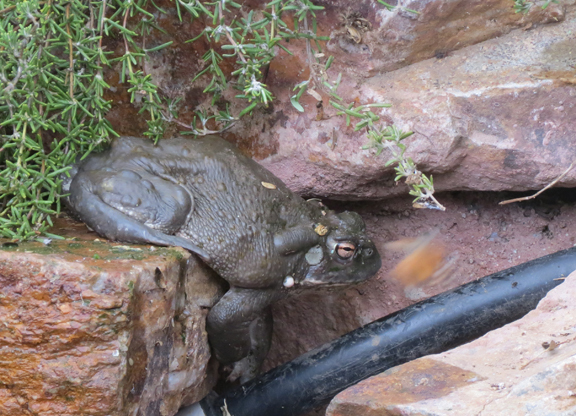 Unfortunately, we’ve discovered Jabba the Toad hanging out in the darker recesses of the pond’s filter system. Hopefully we won’t discover him in the pond. 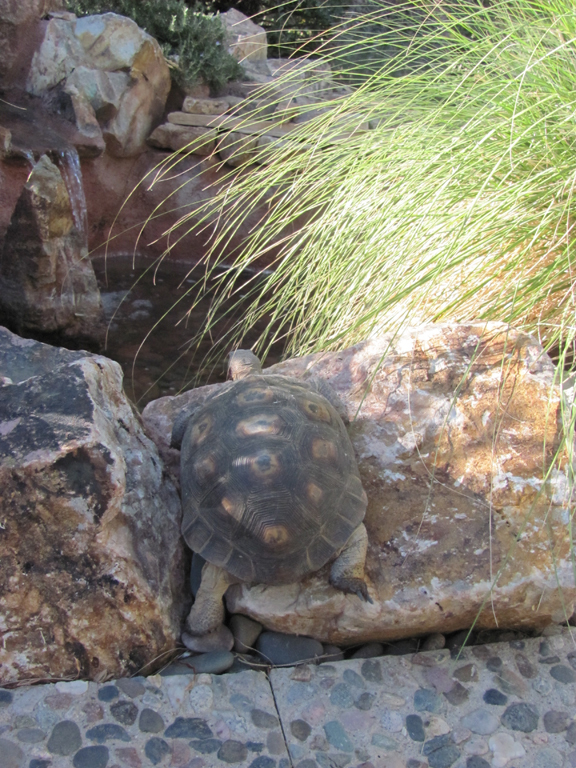 Our torti girl is getting ready to hibernate…but she doesn’t like the burrow that Todd built her. 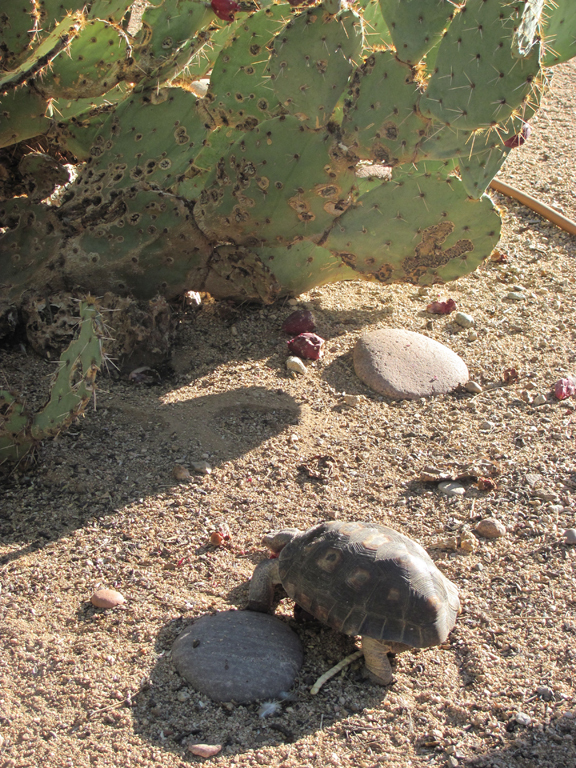 Todd talked to an expert today, and he said that the desert tortoises winter burrows need to face south. 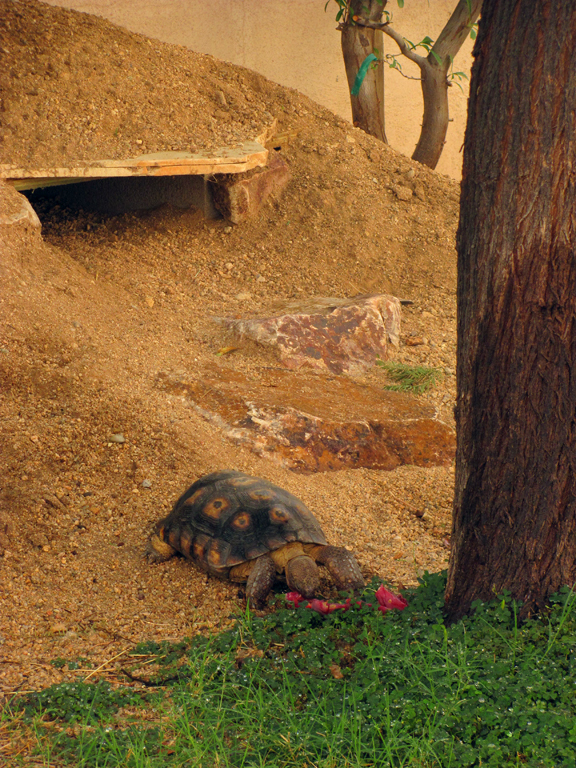 Unfortunately, the wonderful summer burrow faces north….and Tortalee does not like it! She has not been sleeping in her house with the temps staring to dip! I found her the other morning, under a bush on the south wall of the house, groggy and grumpy. Sooo…. we are going to embark on the construction of a new enclosure, that’s just off the back porch, with lots of sunny southern exposure for the winter. In the mean time, TL came in the house today (through the doggy door), to make her laps around the house. I think that she may be looking for a good place to hibernate in the house. 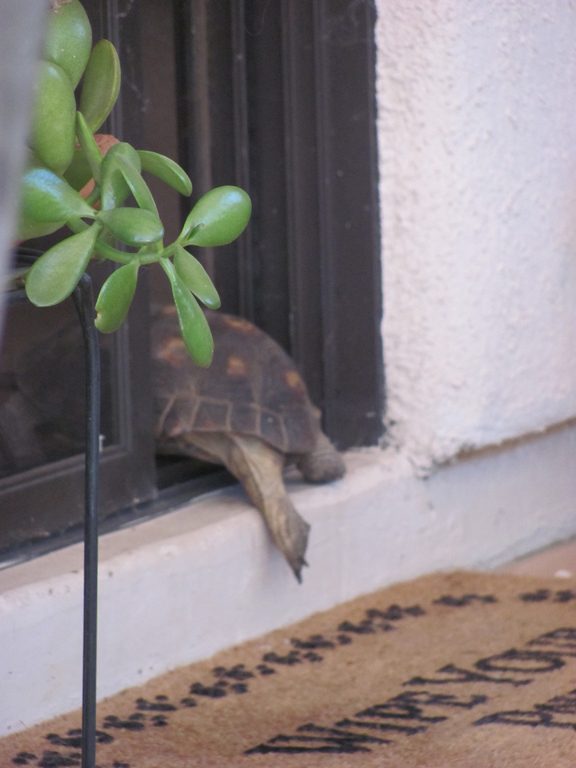 We have friends that keep desert tortoises and they let them hibernate in their house….in a box….in the closet! I just don’t see that happening here! But, I guess if that works, it works. But, hoping that TL will adapt to Todds Backyard (Outside the enclosed potty garden where she lives now), I thought that I would let our little torti girl out on the porch to investigate her future home. And, she had quite the time! One of the first things she did, was wander off of the porch and find the pond. When she is attracted to water it usually means that she’s thirsty. 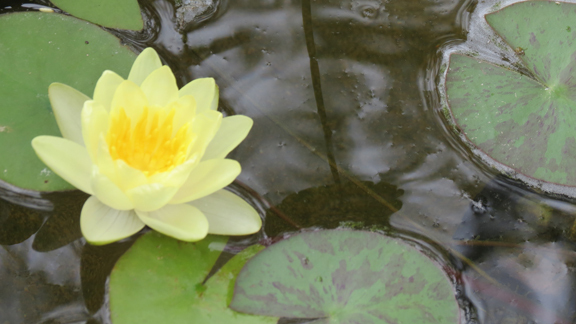 So, before she plunged head first into the pond to drown, we turned the hose on the pavers and she waded and drank to her heart’s content….then made her way in the opposite direction, to explore some more! Ohhhh! 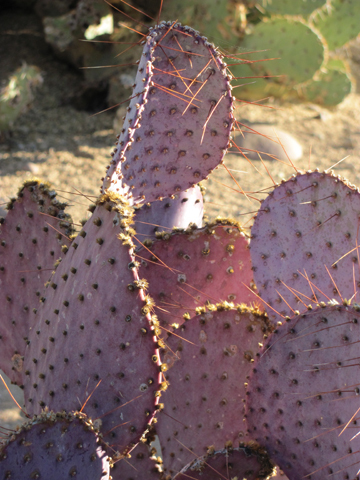 Prickly pear fruits…TL’s favorite! So, she made her way into the yard, finding all of the fallen fruit, (prickly pear). But what was really cool is that she got to discover the fruit herself, instead of being offered on a platter of veggie delicacies. She sampled various fallen fruits as she made her way deeper into Todd’s Backyard. 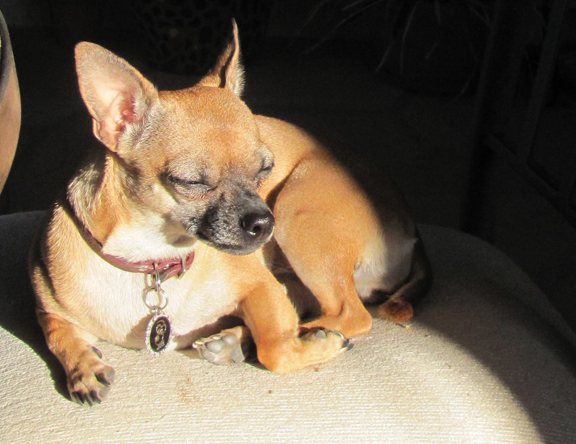 But then, to our surprise, she found her way back to her favorite spot! Tomorrow, Todd will be working on TL’s new space….It will be outside! …It will be facing South! …..And she will be sleepy, sleepy, happy, happy, there this winter! Needless to say, it did’t seem like a great beginning to an otherwise peaceful Sunday morning. 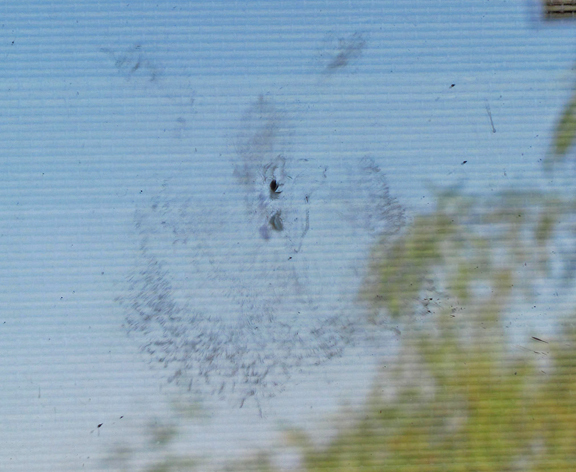 However, we were pleasantly surprised to open the sliding glass doors to a cool breeze reminiscent of cooler spring days and the yard drenched in a lovely late Spring, early morning light! The day was looking up! I think it IS going to be a lovely day! 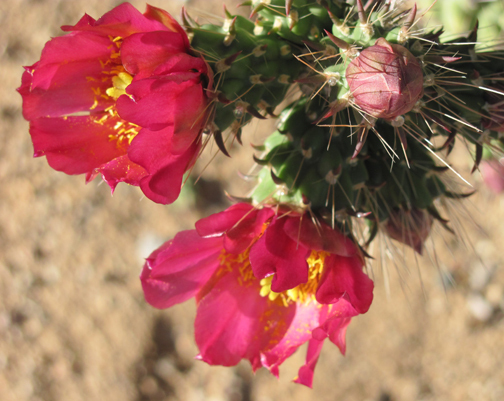 Now, this may not look like much to some folks, but the blossoming cactus are the star of the show…. And it’s just the beginning! 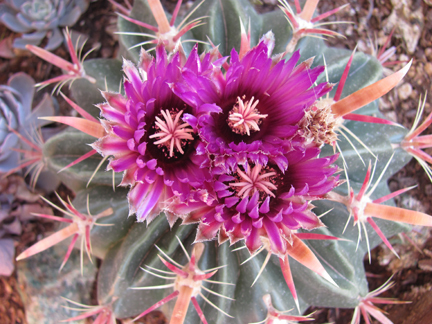 This is something we haven’t seen…two different colored flowers on the same plant! 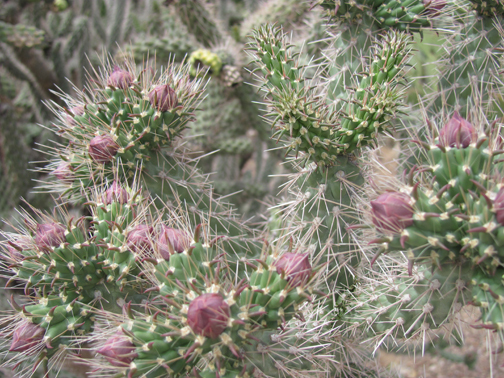 The Buckhorn cholla, ready to burst with fiery fusha flowers! The entire yard is ready to burst with color! 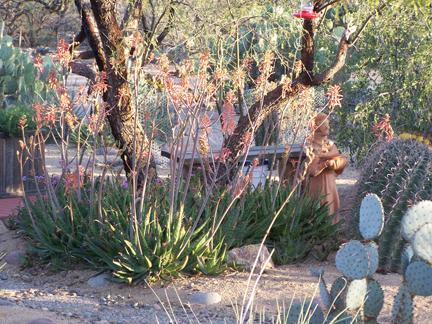 The possibility of total dazzlement , is due to all the rain that has blessed the desert this winter. In the seven years we have lived here, this promises to be the most amazing seasonal event we have ever witnessed! And this is going to be one of the most spectacular events….hopefully tomorrow night! Can’t wait for all the incredible ‘blossombilities’! 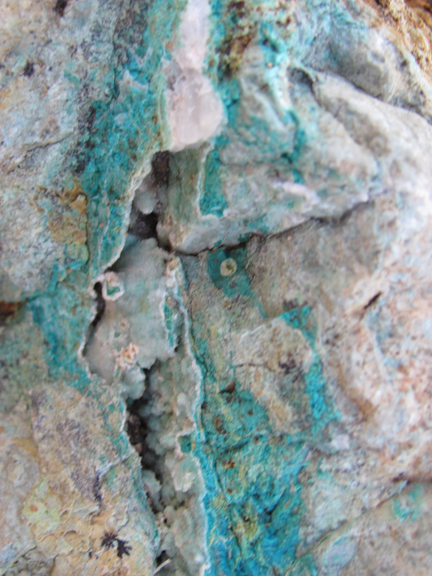 I don’t know if I ever mentioned…We live on a mine! 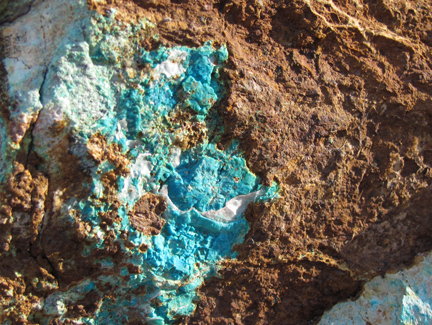 Todd’s Backyard sits on the east side of Freeport Copper and Gold. When the city decided to improve our main thorough fare, we had heaps of rock piled along side the road. It looked like piles of brown dirty rock. Our good neighbors, George and Eileen, suggested that we take a hammer and go investigate. Armed with hammers and a wheelbarrow, we journeyed to the road, determined to uncover something amazing. We were not dissappointed! 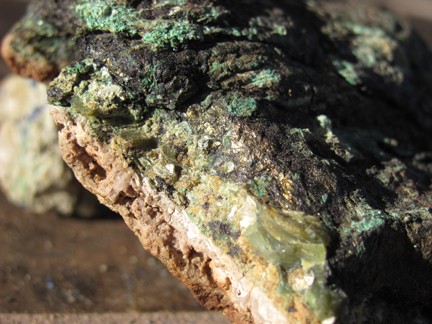 Below the brown, mud encrusted debris, we uncovered treasure!!…. 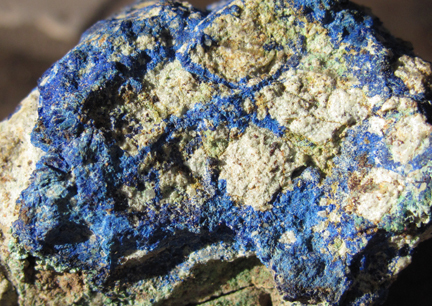 I bet there’s gold in them, thar rocks! If not gold…beautiful color for sure! One of these days, we are going to prospect in the wash that runs behind Todd’s Backyard! Even if we don’t find gold, Todd’s already developed a treasure above ground! But it’s always fun to find what might lie below! 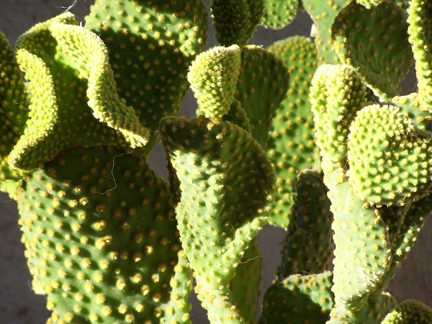 Cactus are amazing! 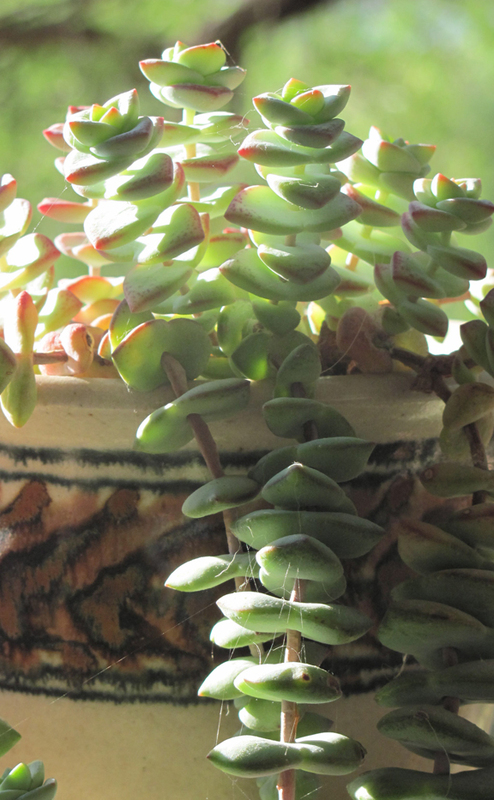 I always thought that they were the ugliest plants…in fact, I never even considered them plants. 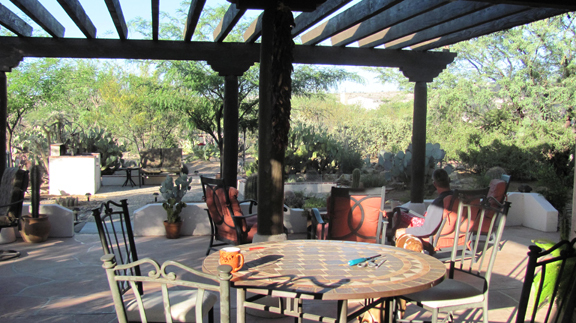 But the longer I live in the desert, the cactus have really grown on me! 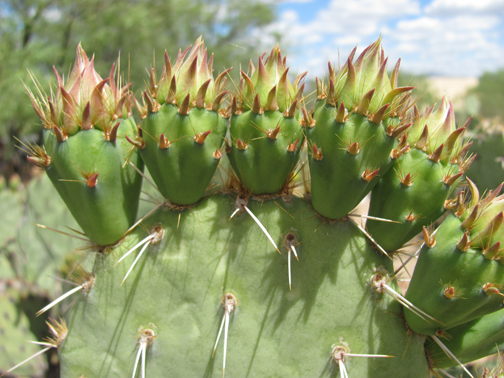 And sometimes even stuck on me….not so much a cactus fan when I step on a cholla or back into a prickly pear. But they still amaze me. We have a many varieties of ‘prickleys’ in Todd’s Backyard. 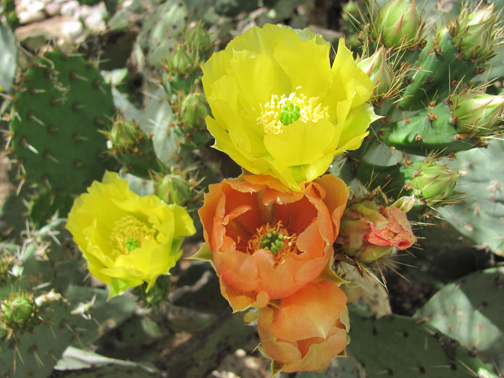 Cactus are particularly beautiful when they are blooming! And sometimes they are just weird! 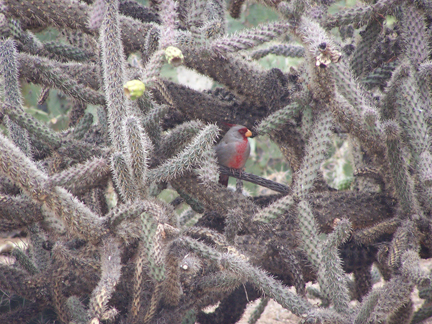 The birds don’t mind the prickles! Many make their nests among the spiny arms. 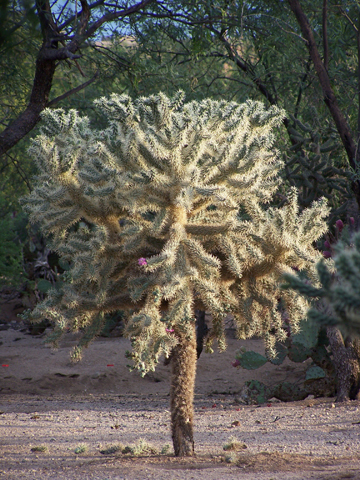 The Cholla are especially popular nest sites for birds. Even though the needles are poisonous! 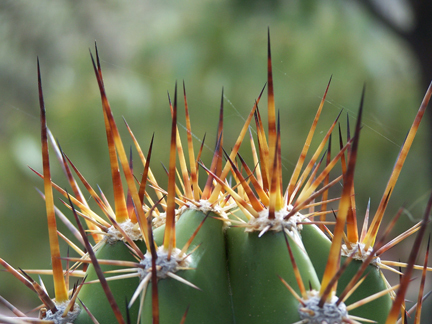 You could even die if you fell into a cholla and got totally embedded- not just because of the poison prickes, but you probably would not be able to detach yourself from it! Danger abounds in Todd’s Backyard! But then, we do have the healing Aloe Vera growing like weeds! Not only useful, but beautiful when they are in bloom! 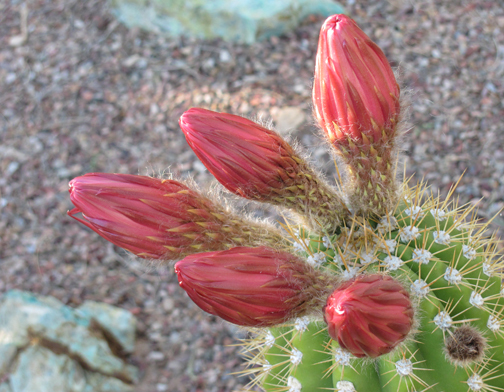 More on cactus to come….We should have an amazing blossom season in May, as we’ve had a pretty wet winter. 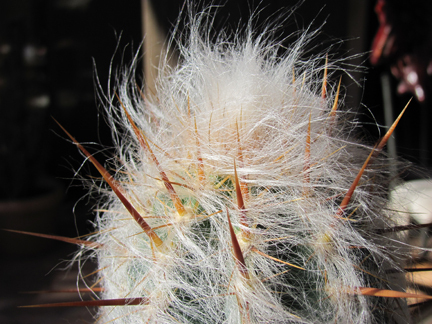 Springtime in the desert is truly when we are ‘tickled’ to be prickled!